Directed by Orville Peck and Carlos Santolalla. From Pony, out now on Sub Pop. There’s been a spate of videos with dudes in masks of late, which I guess makes sense in the era of Trump and Brexit. We all have a little something to be ashamed of and perhaps a compulsion to hide from our responsibilities. 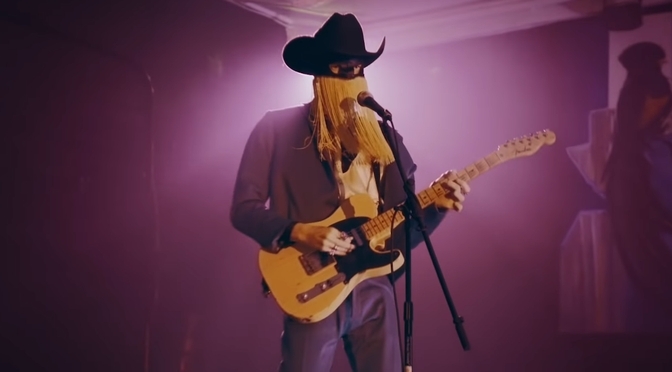 Sub Pop crooner Orville Peck takes it one further by also masking his influences and genres, and it works like a charm. And maybe it’s not about hiding at all? Read any other review of his work and you hear a lot of Outlaw Country acts bandied about as musical references, which I guess is true, but I hear something else entirely. What I hear is a Bret Easton Ellis soundtrack. Not the Huey Lewis variety, but one that would play in an indie production of one of his books. There’s a bit of Big Country and Love and Rockets and The The and a whole heaping of Wall of Voodoo. While mining the 80s is in fashion these days, Peck has tapped a new vein. It’ll be interesting to see what else pans out. Orville Peck: web, twitter, amazon, apple, spotify, wiki.